A scientist, or any knowledgeable person, will tell you climate change is a serious threat for Canada and the world. But the RCMP has a different take. A secret report by the national police force, obtained by Greenpeace, both minimizes the threat of global warming and conjures a specter of threats posed by people who rightly call for sanity in dealing with problems caused by burning fossil fuels. The RCMP report has come to light as federal politicians debate the "anti-terrorism" Bill C-51. Although the act wouldn't apply to "lawful advocacy, protest, dissent and artistic expression," its language echoes the tone of the RCMP report. It would give massive new powers to the Canadian Security Intelligence Service to prevent any person or group from "undermining the security of Canada," including "interference with critical infrastructure" and the "economic or financial stability of Canada." And it would seriously infringe on freedom of speech and expression. The new CSIS powers would lack necessary public oversight. The RCMP report specifically names Greenpeace, Tides Canada and the Sierra Club as part of "a growing, highly organized and well-financed anti-Canada petroleum movement that consists of peaceful activists, militants and violent extremists who are opposed to society's reliance on fossil fuels." The report downplays climate change, calling it a "perceived environmental threat" and saying members of the "international anti-Canadian petroleum movement ... claim that climate change is now the most serious global environmental threat and that climate change is a direct consequence of elevated anthropogenic greenhouse gas emissions which, reportedly, are directly linked to the continued use of fossil fuels." It also makes numerous references to anti-petroleum and indigenous "extremists." Language in the RCMP report and Bill C-51 leaves open the possibility that the act and increased police and CSIS powers could be used against First Nations and environmentalists engaging in non-violent protests against pipelines or other environmentally destructive projects. As University of Ottawa law professor Craig Forcese points out, with its reference to "foreign-influenced activities within or relating to Canada that are detrimental to the interests of Canada," the anti-terrorism law could be used in the case of a "foreign environmental foundation funding a Canadian environmental group's secret efforts to plan a protest (done without proper permits) in opposition to the Keystone Pipeline Project." Considering that government ministers have already characterized anti-pipeline protesters as "foreign-funded radicals," that's not a stretch. The RCMP could consider my strong support for greenhouse gas emissions reductions and renewable energy as "anti-petroleum." Combating terrorism is important, but Canada is not at war, and we already have many laws -- and enhanced police powers -- to deal with terrorist threats. More importantly, the RCMP report fuels the legitimate fear that the new law could be used to curtail important civil liberties, affecting everyone from religious minorities to organized labor and First Nations to environmentalists. If, for any reason, someone causes another person harm or damages infrastructure or property, that person should -- and would, under current laws -- face legal consequences. But the vast majority of people calling for rational discussion about fossil fuels and climate change -- even those who engage in civil disobedience -- aren't "violent anti-petroleum extremists." They're people from all walks of life and ages who care about our country, our world, our families and friends and our future. Canada is much more than a dirty energy "superpower." Many people from different cultures and backgrounds and with varying political perspectives have built a nation that is the envy of the world. We have a spectacular natural environment, enlightened laws on issues ranging from equal rights to freedom of speech, robust social programs and a diverse, educated population. We mustn't sacrifice all we have gained out of fear, or give up our hard-won civil liberties for a vague and overreaching law that, as Forcese and University of Toronto law professor Kent Roach point out, "undermines more promising avenues of addressing terrorism." 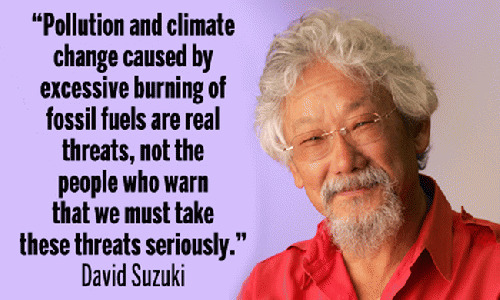 Pollution and climate change caused by excessive burning of fossil fuels are real threats, not the people who warn that we must take these threats seriously. And while we must also respond to terrorism with the strong tools already in place, we have to remember that our rights and freedoms, not fear, are what keep us strong.